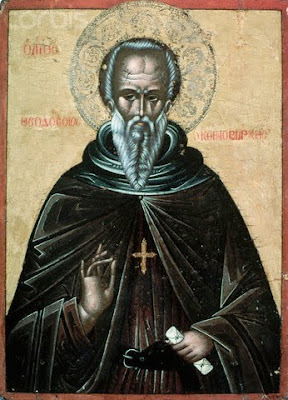 St. Theodosios the Coenobiarch: "Behold, the Grave Is Ready!" The Orthodox Church possesses an inexhaustible treasure in proofs of life after death. One of the numerous proofs is cited here: one example, which, at the same time, witnesses that the souls of men live after physical death and that voluntary obedience leads to blessed eternity. When St. Theodosios the Great [the Coenobiarch] founded a monastery, he had only seven monks in the beginning. In order to confirm these monks in the remembrance of death, he ordered them to dig out a grave. When the grave was finished, Theodosios stood above the grave surrounded by the seven monks, and said, "Behold, my children, the grave is ready! Are there any among you who is ready for death, in order to be buried in this grave?" One of them, Basil by name and a priest by rank, fell to his knees and sought a blessing from Theodosios to die. Theodosios ordered that a memorial service for the soul be held for Basil: the third, the ninth and the fortieth day as is the custom for the deceased. When the fortieth day memorial service was completed, Basil, completely healthy, laid down and died. He was buried in the new grave. On the fortieth day after his burial, Basil appeared among the brethren in church one morning and chanted with them. In the beginning, only Theodosios saw him and he prayed to God that He open the eyes of the others. The entire brotherhood looked and saw Basil among them. One brother, Letios, out of joy spread his arms and wanted to embrace Basil, but he vanished and Letios heard Basil's voice saying; "Save yourselves, fathers and brothers, save yourselves."